Senator Mark Daly Spokesperson in the Senate for the Irish Overseas and the Diaspora and Chairperson of the Ireland America Association has welcomed President Obama’s announcement on Immigration reform last night. The President will today sign his executive order for US immigration Reform. Senator Daly had previously called on President Obama to include ‘Humanitarian Visas’ in his Executive Order and has welcomed the initial outline by the president which may allow some of the 50,000 undocumented to come home in times of distress. 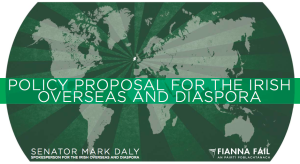 Senator Daly Commented “This is the most positive news the undocumented Irish have received in years, these steps will allow some of them to finally come out of the shadows and live without the constant fear of deportation. One of the most important things for the undocumented is the right to come home, many have missed countless Christmases, weddings and very distressingly for many families funerals. I look forward to the further details that will be announced today.